The Workbench Diary: No Pressure or Anything! Ever since the house project got wrapped up I have been trying to get caught up on my studio work. I’ve had some objects way too long and others keep coming in. I had to stop the flow in by pushing my booking date out further. First things first here. In other news, that Yale presentation is coming up in a couple weeks and I am getting excited about it. It’s titled “The Turner’s Trade: A Demonstration of Colonial Woodturning Techniques”. I have been putting some thoughts together to share as I demonstrate the techniques of pole lathe turning. I think there is so much technical info and background story to share. It’d be a shame to just show off pretty spinning wood and shavings. The info for that one is here. If you miss it, I’m told a recording might end up on the Yale University Art Gallery website. Sheesh. No pressure or anything! In magazine news, I am delighted to be able to announce a new sponsor. Shannon Rogers of The Hand Tool School has joined in the ranks. 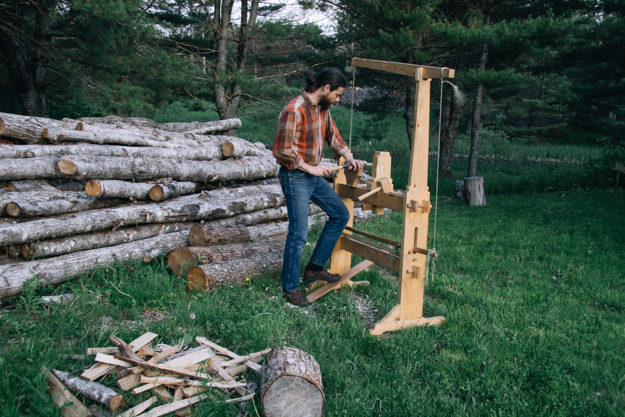 His online woodworking school is a really great place for someone with no prior background to get acquainted with working wood with hand tools. I read his excellent blog regularly (have been for years) and recently purchased a semester from the school. It’s been great to sit in with someone who not only skilled, but has obviously done his homework and communicates very clearly. He’s no nonsense and I like that. If you’re new to this hand tool stuff, check out his school. You can find all the contact info for Shannon’s school at the Mortise & Tenon Magazine site too. Would you have any updates or remarks on the german pole lathe since it was finished back in 2013? For instance, is there anything about the design you would improve upon, or like compared to other lathes? I added a couple braces on the feet to stabilize it. Also, the tail end rocker support snapped when working on a large and heavy piece... I'd beef that up somehow. A metal wear strip on the tool rest would hold up better than my oak one. I added covers over the rocker pin because it works itself out after a while. I also screw or nail the feet and the slat to the floor. I would say it's portability is its biggest asset. Love this picture. It's as if the logs are lining up for their turn at the lathe.